Digital image analysis and image mining: automatic, semi-automatic, and manual. With a single click the user can capture the contours of all objects in the image and produce a spreadsheet with each objects locations and measurements. You can mark objects in the spreadsheet to highlight objects in the image, or vice versa. Extract or remove objects as desired. Pixcavator IA - Image Analysis also includes all standard image processing tools. ...... Extract or remove objects as desired. 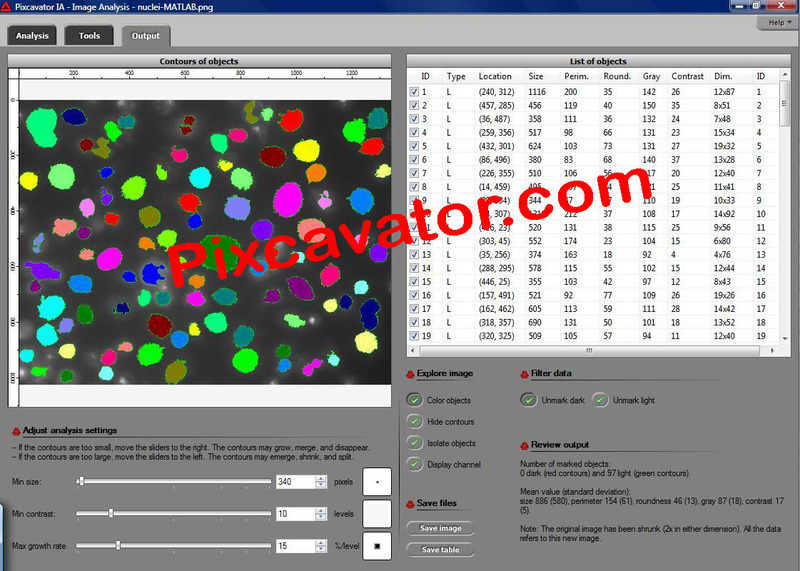 Pixcavator IA - Image Analysis software also includes all standard image processing tools. Pixcavator IA - Image Analysis finds objects in the image. They are automatically captured inside contours and listed in a table along with their sizes, locations, and other characteristics. Stage 1: automatic. The software creates a data structure that contains the complete information about the content of the image. Stage 2: semi-automatic. As the user moves sliders corresponding to objectsa???? characteristics, they instantly change their contours so that the user can choose the best segmentation. The output table is also updated instantly. Stage 3: manual. The user can remove irrelevant details from the output by simply clicking on them. Qweas is providing links to Pixcavator IA - Image Analysis 5.1 as a courtesy, and makes no representations regarding Pixcavator IA - Image Analysis or any other applications or any information related thereto. Any questions, complaints or claims regarding this application Pixcavator IA - Image Analysis 5.1 must be directed to the appropriate software vendor. You may click the publisher link of Pixcavator IA - Image Analysis on the top of this page to get more details about the vendor.